In promotion of his new single “Just Clap” with Hau, and in celebration of his recent signing with Hydrofunk Records for his new project the Folkus EP, this Brisbane producer/emcee hits the road with label mates Tigermoth, 2 Dogs, and Katch. Calski has been a subtle but strong force in the Australian hip hop community for decades quietly and humbly taking his place amongst Australia’s greatest producers with his catchy and soulful beats. 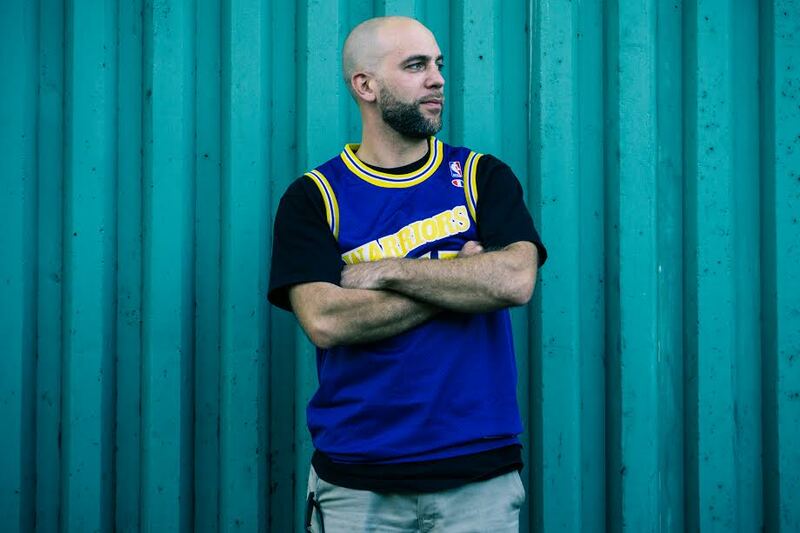 He has always worked with top-notch emcees that compliment his style- Rainman, Dialectrix, and Tommy Illfigga (Tom Thum) just to name a few- while also delivering honest, introspective, and socially challenging lyrics of his own. I first saw Calski perform with Rainman back in 2012 and have been eagerly waiting another Sydney date ever since. So if you’ve got the chance don’t miss out on the rare opportunity to see this talented performer do his thing at Play Bar in Surry Hills Saturday October 1st. Find out more about Calski and his views on Hip Hop through our interview below. "I specifically remember the day. My neighbour brought Tougher Than Leather and from the opening bars of Runs House I was hooked. He had one of those boom box's with a graphic EQ on the front, I started pushing and pulling frequencies in time with the beats just to see what it would sound like. I was really enjoying myself haha! That's probably my earliest memory. I was about 8 or 9 yo. I went out and brought Raising Hell on vinyl the next day with a voucher I had and kept hanging out with my older neighbours. We'd play Nintendo, Dungeons and Dragons, Basketball, Cricket etc. They would always be playing mix tapes that had Public Enemy, Ice T, Ghetto Boys, 2 Live Crew, NWA etc." When did you decide to start producing your own music? Who have been your biggest influences and mentors on your journey so far? "My music teachers have probably been the biggest influences on my music appreciation. I learned cornet, guitar and piano though school years and each teacher presented different challenges and guidance which helped me understand music and musicality. I started gigging in a rock / rap band in '97 but at the same time was making hip hop in instrumentals in my bedroom. Listening to 'Steppin To The AM' on PBS in Melbourne I'd hear a lot of local hip hop and think "I could do this" and by the early / mid 2000's I started playing gigs as a hip hop artist with DJ Bacon. Joelistics from TZU took us on the road and showed us how to engage a crowd, he helped me understand how to set up a decent home studio with that DIY approach to everything." Hip hop has changed drastically over the years both in sound and in demographic of listeners. You’ve been a witness and participant in the Hip Hop community in Australia since the beginning. What would you say some of the biggest changes that you’ve seen from then till now? "While I understand there's history behind me in the local scene, I can confidently say I'm considered old school haha! And with that I get to talk about how it was 'back then' and how things have changed blah blah.... but the main thing I want to touch on is there's definitely a lack of interest in the roots of hip hop culture that is greater now than before. Like, a lot of the hip hop fans of my age regularly listen to funk and soul music which is essentially the roots of hip hop music and culture. We made a point of really going out of our way to understand the where, why, how and who. A lot of that is lost on the current generation. The artists they listen to either don't know the history themselves or they just don't make a point of mentioning it in interviews or the music. If you don't know 'Funky Drummer' by James Brown, stop reading, and look it up now." What motivates you to make music and would you say that overall your music has a certain theme or message to convey to your audience? "I just want to be the best I can be at being me. I love the rhythm of hip hop and I stand for the messages of the culture. Every time I touch the MPC or a record to sample I want to make something that moves people, that makes them lose themselves and forget about anything other than whats happening right now. That's part of the motivation behind why I play music, it helps me be present and is probably a form of meditation. I think people can take away what ever message they like, like with most art it's up to interpretation." You are known for always working with quality emcees on your tracks. Who are some of your favourite up and comers across Australia at the moment? Anyone we should be looking out for? "Thank you. I'm feeling Dawn Laird and have been for a while now. Almost everything she does is killer. I've just been put on to Brisbane young cats Thought Junkies too. They go hard on the bars." I always find it interesting to think that as a producer your mind would process music so much differently to the average listener. When you listen to a piece of music for the first time, be it a Hip Hop track or other, what are the first things that you notice about it? And does it feel like you’re always “working” or is there a certain type of music that allows you to escape? "The first thing that gets me is bass and drums. Unless its stripped so bare there aren't bass and drums haha.... But I can enjoy most songs if the drums and bass are working well together. I've kind of got to force myself to just enjoy live music and not analyse whats going on and how they got the sound or whatever..... It's pathetic hey!! In terms of escaping and switching off Jimi Hendrix is my sleep music."